Saturday night we headed out to Harold's Country Club, a bonafide honky tonk in Yemassee, SC. This restaurant is truly in the sticks, but it is worth every minute of the drive. Harold's was originally started as a Chevrolet dealership in The 1930's but in the 70's it transitioned from a service garage into a place for covered dish suppers on Thursday nights. Today you can find Deep Fried Turkey, Hot Wings or Ribeyes depending on what night you dine. The Harold's experience is 100% pure American South. The family that runs this joint doesn't sugar coat anything except Mrs. Mary's Butter Pecan Cake. The restaurant decor is every bit as eclectic as the crowd that gathers. Harold taught his grandson Bobby how to cook up the steaks just right. 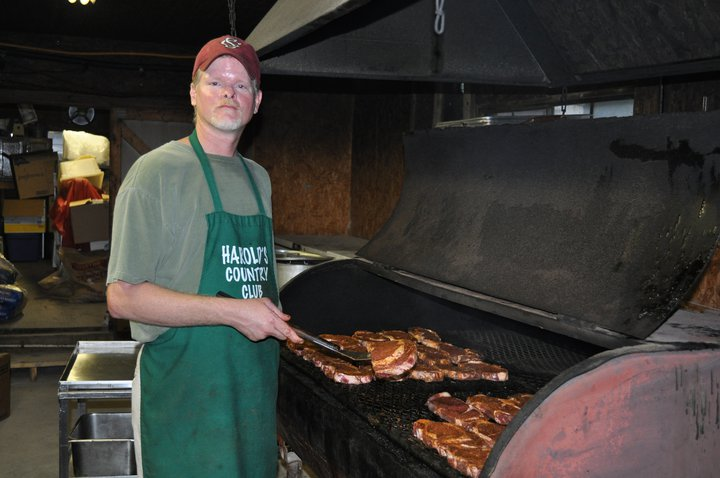 You'll find Bobby behind the grill every Saturday night making your supper. You have to call ahead and order a steak to make sure you get one; but when you get there, they've got a paper plate with your name on it. A night at Harold's isn't complete without round of karaoke. Hank Williams, David Allan Coe and Reba McEntire had some of the best songs played all night. While this might not be you're everyday party, it's certainly a party you don't want to miss.